First question what is the weight of a V4 without a box? Second question -do I need a stand or is a wood pallet ok? Any recommendations of makes and models of cranes and stands? Do's and don'ts? The v4 lump isn't too heavy (but heavy enough to cause you damage)..any good engine crane will lift it. I found my 1.5 tonne crane on Ebay..the plan was to use it and sell it on when i had done..i found i needed it more and more and it's now part of the workshop. You will need a good flat and smooth floor for safe opperation. I have an engine stand but i only use it if the sump or bottom end has to come off otherwise i have a bench i made which is strong enough to support a v8 so it takes the v4 with ease. They don't take much space when stored and I guess B&Q's sell them rather cheaply. I also use the bench to work on engines, I've never used an engine stand. 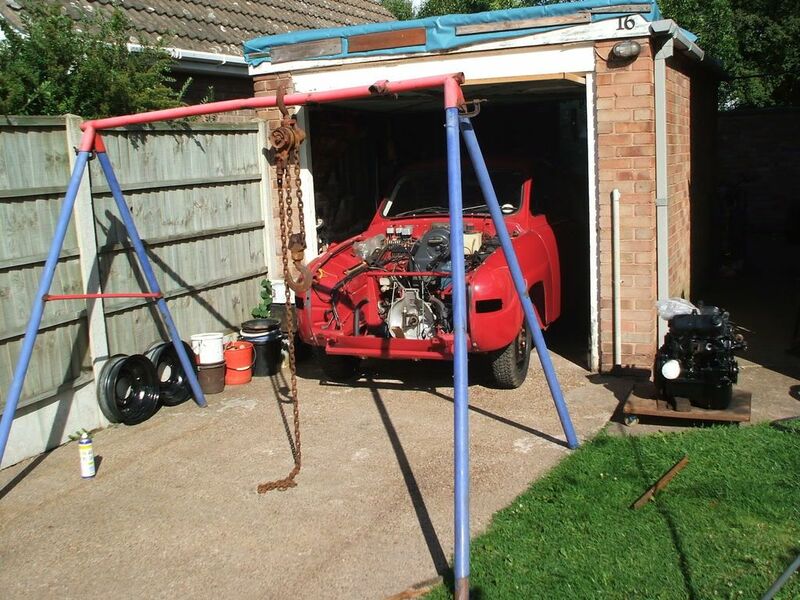 1970 Saab 96V4 "The Devil's Own V4"
The first time I lifted a V4 out, I used a Haltrac hoist with the 4-leg gantry (not sure if you can still get them)! As John has said, it became so useful, I still have it! The only downside was that I was a lot younger and lighter then, and my weight was insufficient to raise the engine off the floor again! I could swing on the rope like Tarzan, to no good effect! I had to wait for a neighbour to help me lift it! More recently, a friend has given me a hand and provided a hydraulic crane when I needed to change the 'box. It certainly made life MUCH easier! And my roof wouldn't support a hoist with an engine dangling from it! The lump isn't that heavy, but still enough to do some damage - there's a lot of inertia there! Do mind your fingers and toes! "Duct tape is like the Force: It has a light side and a dark side, and it binds the Universe together!" Build a bench if you can..it's one of the best tools you will ever have..I used 2nd hand wood and built it into the building..lot's of good thick timbers and a piece of scrap stainless from a local green grocers clear out.. 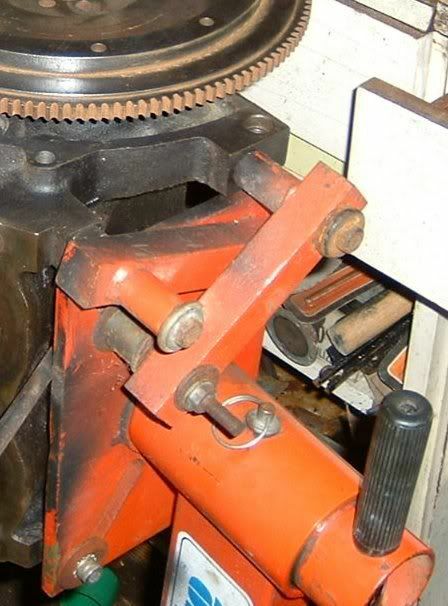 Since the photo was taken i have added a large vice..another invaluable tool! 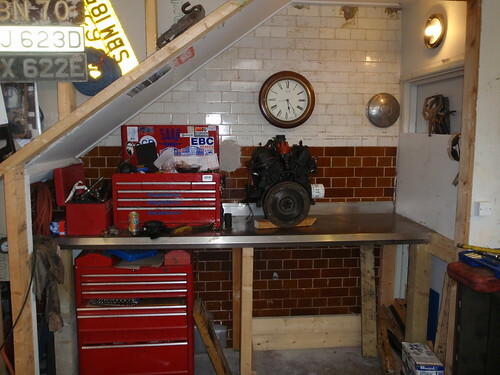 Yes indeed, no workshop without a heavy duty bench and vice! You can also rent a hoist or an engine crane (http://www.hss.com/g/67715/500kg-Engine-Crane-Folding.html) or borrow one from a friend. Hay you lucky people with a garage.I have the wind in my hair & the sun on my face when i work on my car.I don't have a garage.P.s Plenty of wet weather gear for when its raining.Look on the bright side of things,when the car is fixed we get to smile while we are driving our classic's. Looking at the rental prices it just doesn't add up..1 weeks hire=£60 and you will need it for a week because when you remove the engine you will see loads of jobs that could be done "while you have the chance"..this will involve ordering parts or time to do those little fiddly bits and before you know it the engine will have been out of the car for a week..by the time your 2nd weekend has arrived you are reaching £120 for hire..another few ££S and you could buy a hoist..sell it on ebay when you have done..i have watched hoists fetch as much or even more on ebay than buying a new unit..people just get carried away! I have a block and tackle set up similar to Peters..they are cheap and very controlable but you do need a frame of some sort or a VERY strong rafter in your garage...always worth chatting to a scaffolder..you might pick up a set of tubes for the price of a drink! I have an old hydraulic "personnel lifter" - bought on ebay for £35 a few years ago - that was originally designed to lift [old/disabled] people in and out of bath/bed. SWL is 130kg so plenty for lifting a V4 engine /gearbox using a couple of short chains and a nylon ratchet strap wrapped round the back end of the gearbox. I must admit that I [now] prefer to remove the engine first, on its own, followed by the gearbox. Much easier to disconnect the drive shafts that way (unless they're already out!). When I changed the engine/gearbox in my 99T I borrowed a huge old engine crane from my local Saab indie - it all went in the back of my 9-3SS, too ! Accomplished the changeover on my own, with no additional help - challenging - useful that I have long arms for refitting the drive shafts while juggling the engine with the other hand. The Troll's engine bay looks so neat and tidy - nice one, Woody. Fine set up there john-saab. Beast of an engine Woody.....great to see. Saabologist, maybe a bit off-topic but maybe handy to know: if the front bar that runs over the radiator hasn't already been made detachable, do so befor you lift out the engine. It makes it a lot easier to get the engine out and in again. Screw down a piece of L-shaped bar under the original one (two vertically and two horizontally placed screws), remove it and then saw away the original bar. This way you won't get distortion. Saabologist, maybe a bit off-topic but maybe handy to know: if the front bar that runs over the radiator hasn't already been made detachable, do so befor you lift out the engine. It makes it a lot easier to get the engine out and in again. Is that difficult with or without gearbox?- was going to change the clutch and was planning to leave the 'box in. 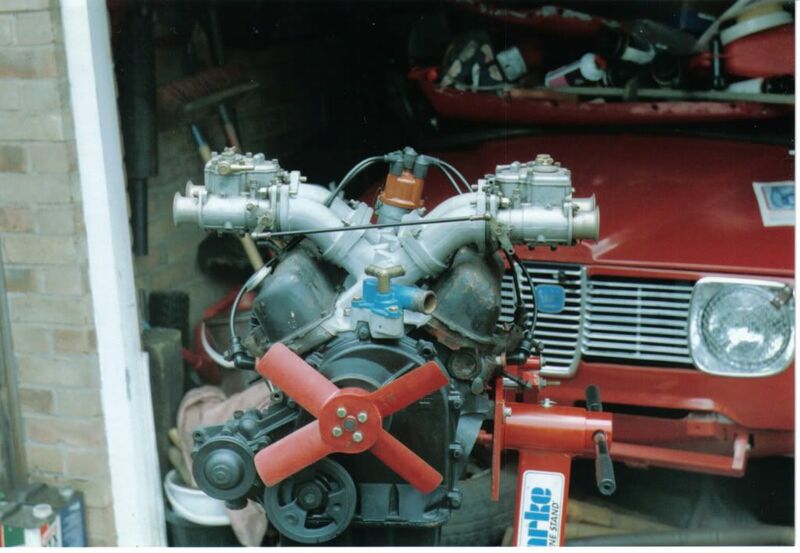 Don't know about the Sonnet, but on the 96, the engine comes out quite easily without the 'box. Based on 96 experience, I would say don't remove the 'box unless you absolutely have to!